1 – The Ruhebereich (Quiet Zone) is supposed to be free of talking and cell phones. Yeah. In the US and England this is enforced with dirty looks and I was worried that my typing might be a problem in this zone. HA! There are families talking (loudly) and people making cell phone calls left and right. 2 – The conductors seem way less worried about tickets than in the US or England. The conductor has walked past me twice so far and not even glanced at me, even when I was holding out my ticket. The other day on my 40 minute trip I never saw a conductor. I totally could have ridden with out a ticket. But I wouldn’t do something like that. 3 – I finally found the power plug. It is between the seats. AMTRAK – take note. Having to put your cord over other people to reach the window wall is not cool. Between the seats is an equilibrium. Very cool. 4- The bigger the train, the more essential having a reservation is. Especially on weekends. SO worth the extra 2.50 euros or whatever it was to have a guaranteed spot. 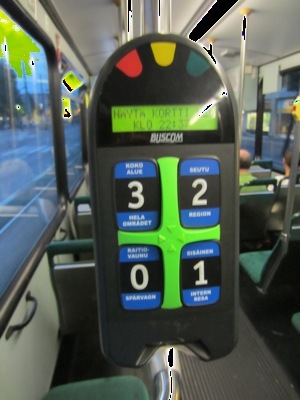 When boarding the Helsinki Tram, you may need to validate your day pass. Quick. How do you do it?